It was dawn, and I was waiting with my daughter Selena outside for a relative to arrive at Hmemim military airport in Latakia when a line of clean Russian armoured vehicles and trucks had passed us, as clean as the uniforms of the Russian soldiers and officers on these vehicles. I frankly wish that our army would have more advanced pieces of equipment than that, and I don’t understand why the delay in doing that. Why not make our vehicles that neat with everything, tires, trucks, and everything. I walked up to the middle of the street and asked my 3 and a half-year-old daughter Selena to wave to the Russian soldiers and officers along the line with so many personnel. Russians do like kids a lot all I wanted is for my daughter to get to know those knights who gave us their hands when almost no one else did. “my dear wife: we saw a beautiful young blond girl with her father this dawn, she waved to all of us with a big smile on her face and I smiled and waved back because she looks like my daughter whom I left with you in Russia, she reminded me of her smile and that I am doing the right thing here”. 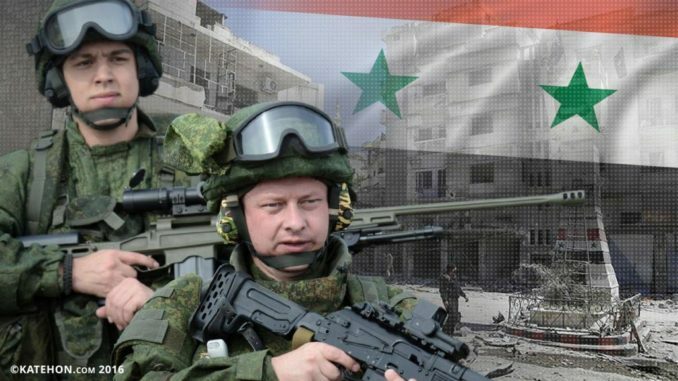 I personally assure to not only the Russian leadership but to the Russian officers and soldiers that their war along with Syrian Arab Army “an army that’s made of high level educated people”, “the children of the poor”, their choice is the right choice and they always have to be proud of it in their diaries and in the history books that are going to be written later in Russia for they have written history here!! and I assure this to all the Russian officers and soldiers who left their wives and children in the Russian far away cities: we are very grateful. Opinion | Peter Ford: The Road to Idlib and Beyond: Where next for Syria?